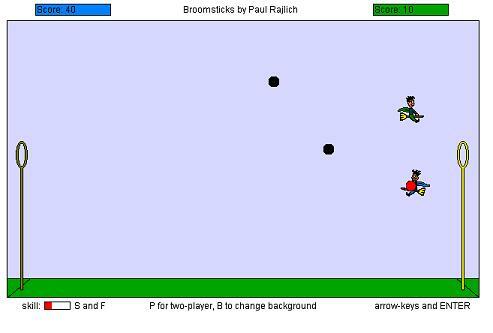 Broomsticks is based on Quidditch from the Harry Potter books. Carry the red ball through the hoop to score 10 points! 1. When two players collide, the player that is lower is bumped. 2. When a player collides with a black ball, the player is bumped. 3. When a player gets close to the red ball, the plaer catches the ball. 4. When a player puts the red ball in the opponent's hoop, 10 points are scored. 5. First player to score 50 points wins.